Let’s face it – this time of year can seem a little bleak. The cosy twinkling’s of Christmas has passed, the exhilaration of a shiny New Year has worn off, and it can leave us feeling a bit flat. I’ve been exploring ways to make the early part of the year feel less like a time to ‘get through’, and more like a unique opportunity to restore and rejuvenate – I hope they help you to relish the weeks ahead and make them into a special time of year in their own right! 1 – Honour your human rhythms. We may not actually hibernate like animals do, but if ever there was a time to replenish our energy supplies with plenty of rest, it’s now. Are you waking up before your alarm, feeling well-rested? If not, then perhaps it’s time to listen to your body and spend longer in bed by beginning your night-time routine earlier. An early night can feel really luxurious and nourishing, and if you struggle to fall asleep at an earlier hour, why not drift off listening to a guided relaxation? 2 – Speaking of night-time routines – do you have one? We might give our children a warm bubble bath, hot milk to drink and a bedtime story, but how often do we cosset ourselves like that? It’s time. If you tolerate dairy, milk is a great source of tryptophan, which is a vital component of the neurotransmitters serotonin (the happy one) and melatonin (the sleepy one), so a mug of hot milk isn’t just for kids! I love it heated with a few slices of ginger, a stick of cinnamon and a teaspoon of manuka honey. If you don’t do dairy, it’s also delicious with nut milk, and half a banana will give you a vegan tryptophan boost. Go old-school and read a book instead of a screen, cosy up with a hot water bottle… you’ll soon be relishing the prospect of that early night! 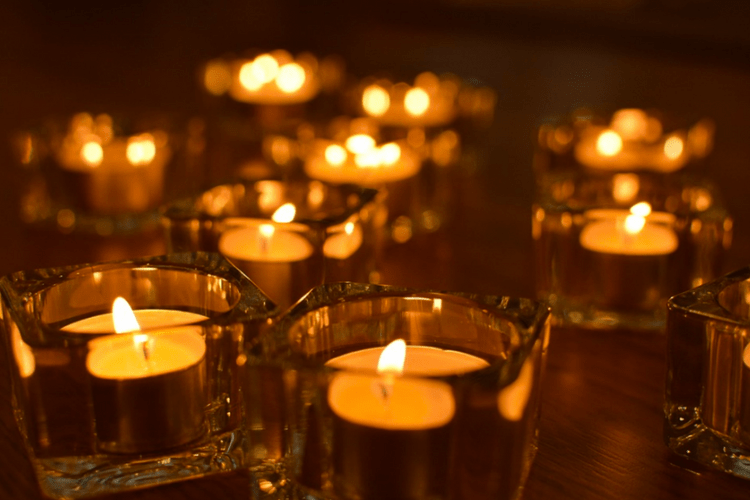 3 – Get romantic on yourself and light some candles! 4 – Pimp your Savasana! I can’t over-emphasise the importance of taking time with your final yoga relaxation posture. 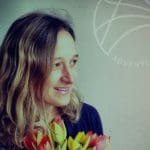 Too many of us dash through it – there are things to do, places to be – but this is where you absorb the deeper benefits of the practice and it’s absolutely vital. You want to leave that mat feeling relaxed and revitalised, not scattered and half-done, so take plenty of time, and give yourself the deluxe 5-star Savasana experience! Place a bolster or rolled-up blanket under your knees (or even put your lower legs on a chair) and cover yourself with a soft and cosy throw. Place something over your eyes – a lavender scented eye-pillow is a wonderful thing to treat yourself to for the price of a few takeaway coffees, but a t-shirt folded into a long rectangle will do the trick. Give yourself ten minutes here, and you’ll feel truly restored. It’s the time of year when our bones are chilled and our energy is low; so nourish both your annamaya kosha (physical body) and your pranamaya kosha (energy body) with comforting soups, casseroles and stews. Fresh seasonal vegetables are full of energy – prana – and nourishment, and if you put it all in a big pot to slowly bubble away, you’ll have a delicious, replenishing meal making your home smell wonderful and that satisfying sense of doing something really good for yourself. I hope those suggestions sound tempting! When we allow our ancient, intuitive caveman wisdom to guide us in what we really need, this time of year becomes so much more than the hiatus between the holidays and the first days of spring; it becomes a sacred time of reconnecting with ourselves and truly restoring our vital energies.